If you are a mom whose body went right back to normal and you walked out of the hospital in your pre-pregnancy skinny jeans, then this post is not for you. If you are a mom who has trouble areas that were never trouble areas before, whose body shape has changed, or simply has some extra baby pounds to shed, then this post is for you! Before having kids, I never really had to worry about clothes not being flattering on me. Even in the year or two before having kids when I weighed a bit more than I preferred, I still had a flat stomach and clothes looked fine once I went up a size. After having kids....that's a different story. Even though I currently weigh almost 10 pounds less than I did before I ever got pregnant, things just aren't the same. I definitely do not have a flat stomach and the love handles I am rocking are a totally new thing to me. But hey, that belly housed an 11 pound baby, so it's bound to happen, and I am OK with it! I've come to terms with the fact that I could lose all the weight I possibly can and my shape just won't be the same. I know this isn't the case for everyone, but for me it is. I finally figured out several months ago, that it was more about the clothes I was wearing. I needed to find things that were more flattering for my mom bod, instead of trying to squeeze into pre-baby clothes that just didn't look good, even if they fit just fine. I wasn't feeling good whenever I got dressed and that can take a toll on you emotionally! Especially if you are already feeling self conscious after having a baby. 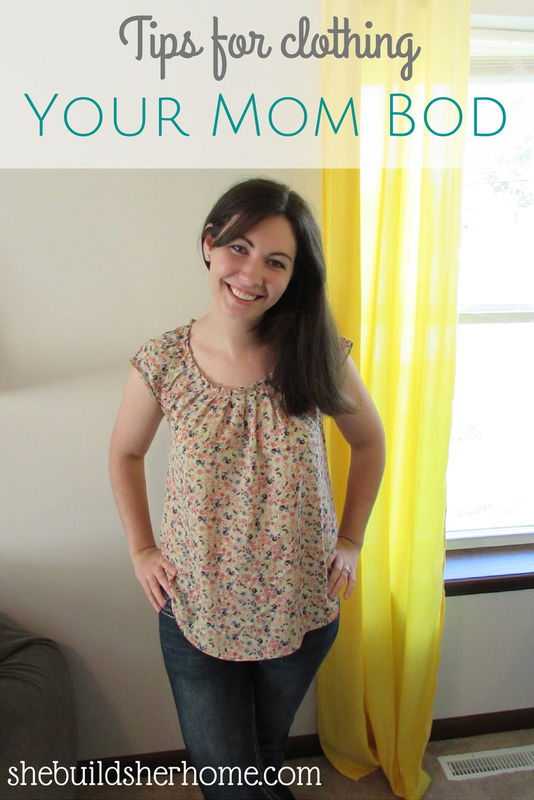 Here are some of the steps I've taken to feeling better in my clothes again (besides working out and eating healthy). Identify your "problem" areas. This is one of the hardest things to do, but you already know what they are. I hate to even call them problem areas because they aren't a problem, but that's the best term I have here. The areas that make you feel self conscious or that are least flattering in clothes. Post kids, it's my stomach region. So for me, I am going to focus on finding clothing that flatters my middle section. Identify the areas you are having trouble clothing, and go from there. Go through your closet. Take a look at your closet and pitch the things you already know aren't going to work. This was really hard for me because for a long time I saved things that I used to love in hopes that it would someday flatter me again. I had to come to terms with the fact that it might not. And it's ok! It really is. If you do want to keep them for the future, start a box or tote to keep them in until that day comes. After going through those, make a pile of the things you think might be ok and try those on. Take a good look in the mirror from every angle. Ask your husband to take pictures of the back if you need to. Do whatever it takes and ask yourself if you really feel comfortable in it, and if it flatters you at this exact moment. If it doesn't, add it to the other pile or box. Browse styles. Think about what is going to be most flattering on you. I used to wear pretty plain tops and jeans with cute accessories. Now, plain and fitted tops are the least flattering on me because they draw attention to my middle section, which is exactly what I don't want. 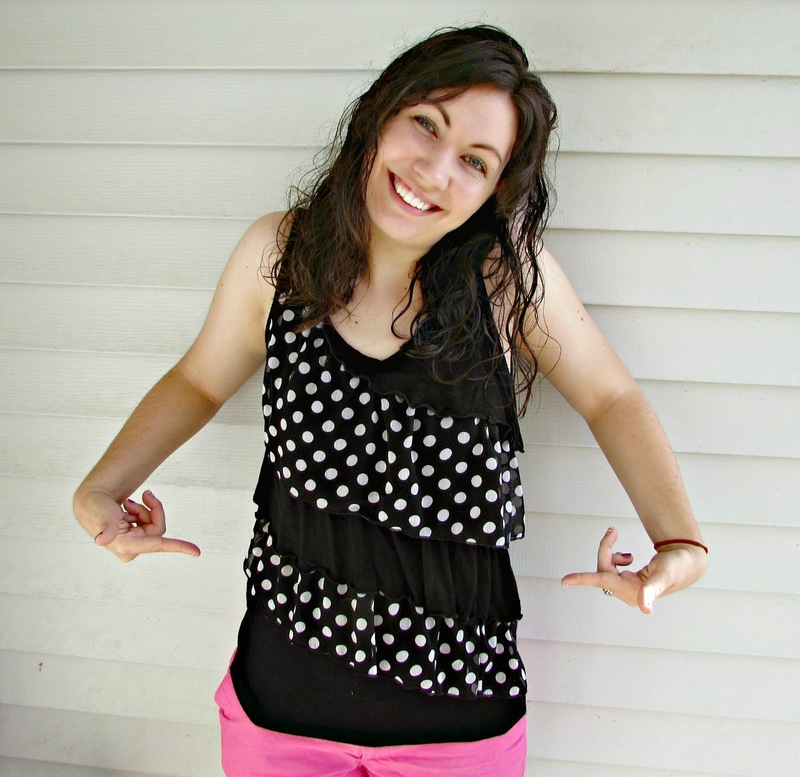 I have found that patterned tops and tops with extra fabric on the front are my best bet! Look online, on pinterest, on style blogs, etc. for different options and decide what you think will be some of your best and most flattering bets. Ruffling on the front means nobody (except now all of you) knows what's goin' on under there. Make a list. Now's the time to really narrow down what you're looking for. Maybe you are set on pants and it is tops that are your problem right now. Write that down. Write down a few specifics of what you are looking for so you can keep those in mind. I.e. tank tops or jackets. This will help you not to stray and just buy pants because you know they work and make you feel good. Last spring, I knew I needed shorts so that was the number one thing on my list to find. 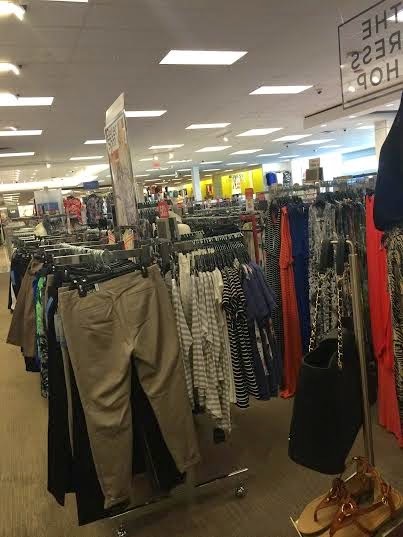 I wasn't sure what style would be best, but while trying on clothes, I quickly figured it out...see the next point! Go shopping! The best part, right?! Well, maybe. I used to just be able to walk in a store, grab my size and check out without trying things on. If I liked a shirt and it was in my size, it worked. Now, that is so not the case. I have to try it on and actually look at it from every angle, move around in it the ways I move with my kids, etc. to see if it is going to work for me. I go with a broad category in mind (I recently needed summer tops and shorts), and try on a few styles to see what is going to work. 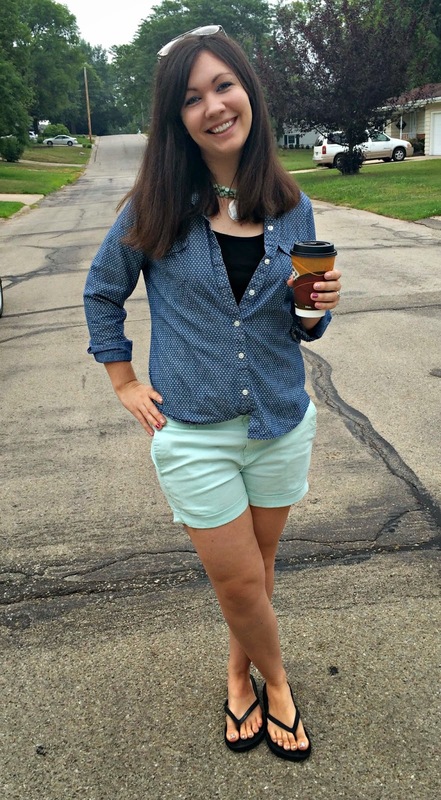 I found out that jean shorts are generally less flattering on me than colored shorts. Go figure! So I stuck with the one pair of jean shorts that I had, and bought a few pairs of colored shorts to get me through summer. Ask for opinions. Take a trusted friend with you, or text pictures to a few people and ask for their opinions. Keep it broad so there is no room for hurt feelings. Just ask them for their honest opinion...can you pull off that style? Is it flattering on you or not so much? Sometimes someone else will notice something that you won't notice, or vice versa. If everyone else says you look great in it and all you can notice is your muffin top, chances are other people aren't noticing it. But ultimately you should buy what you are most comfortable in! You are adorable!! And looking good mama! This post was helpful even for us non mommas too ;) great tips!